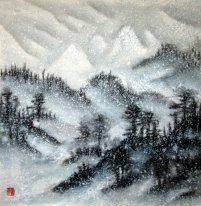 Chinese Snow Paintings for sale! 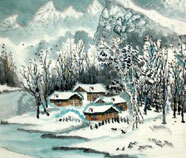 Chinese Snow / Snowscape Painting occupies an important place in the Chinese landscape painting the whole time. 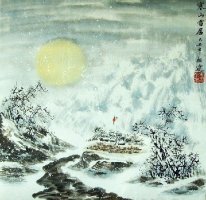 Artist like painting snowscape because snow got something that is bound up with their soul. Snowscape is a symbol. Artist paint snowscape not especially for emphasizing the cold of the snowy world, but for giving expression to their mood through painting. In a sheer whiteness, all the dirt seems disappeared. It reflects painter's feeling of high moral principle and detachment. 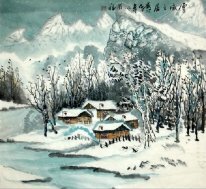 About the content of snowscape, ancient painters prefer natural landscape, modern painters mainly paint snowscape with human related items. And modern snowscape pays more attention to sketch from nature. So representationalism of western painting become more suitable for modern snowscape to a large extent. It makes painting appear more appealing and vital. Thus its appeal of beauty seems more obvious from the sight of appreciation.